Sculpzilla was designed to fulfill the need for a streamer that would dredge the deepest pools while enabling an effective presentation of a sculpin darting for a hiding place. While working with the prototypes, a stinger hook was chosen because of great holding properties, and less damage to fish due to the narrow gauge and short shank of the octopus hook. Another design benefit of the stinger is that since the hook is not connected to the head in the traditional sense, the back end of the fly tends to ride above the head, leading to less hang ups against bottom structure. This pattern has caught fish in both fresh and salt water from Alaska to Tierra del Fuego. While Sculpzilla was designed as a streamer for big mean trout, it has also proven effective for char, steelhead, grayling, salmon, sea run browns, sea run cutthroat, rockfish, and smallmouth bass. A fly for rivers with light colored granite bottoms, or where rainbows are feeding on both sculpins and flesh flies. This could be an injured sculpin, that has been partly skinned, and escaped from a large predator fish. Whatever the reason, it is effective. Many saltwater sculpins are dark colored. Try this pattern in dark bottom streams, estuaries or off the beach. This is the over-all winner for most inland rivers, especially big rivers that have some weed growth in the summer. Sculpins are small, bottom dwelling fish that inhabit most trout streams. There are dozens of fresh water species in North America. Locally there are three, which are native to the Sandy River basin and several others that are native to the Deschutes basin. Size and color varies by species and habitat. Mature freshwater sculpins are usually from 1-1/2" to 4" in length and range through most of the shades of tan, brown and olive. Sculpins have large flat heads. Their eyes are set rather closely together on top of the skull. Body conformation is long and narrow. All of the fins including the tail are rounded. The pectoral fins are unusually large. Body coloration is dappled to camouflage with the streambed. Sculpins are chameleon-like and change color quickly to match their surroundings. 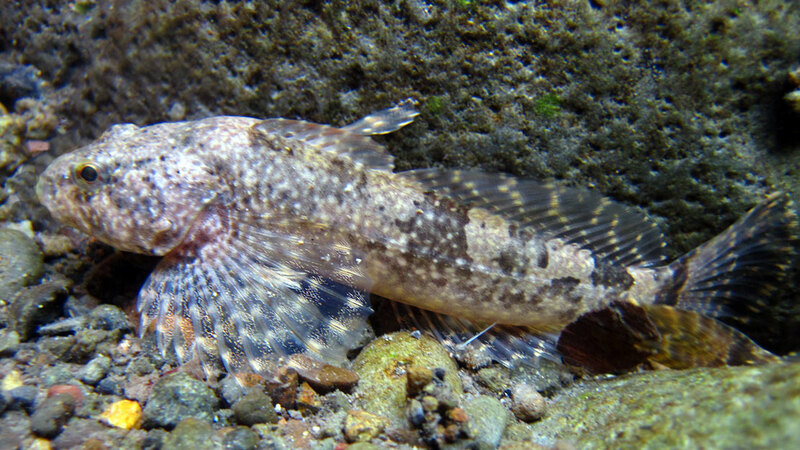 Sculpins do not have air bladders, so they are confined to the bottom. Here they hunt and hide in near lizard-like fashion. They eat a variety of aquatic organisms, but are specifically designed to raid other fish's redds. They enjoy wriggling down between the stones to capture eggs and fry. The result is kind of like the lion/hyena wars. Trout probably grow up hating sculpins. 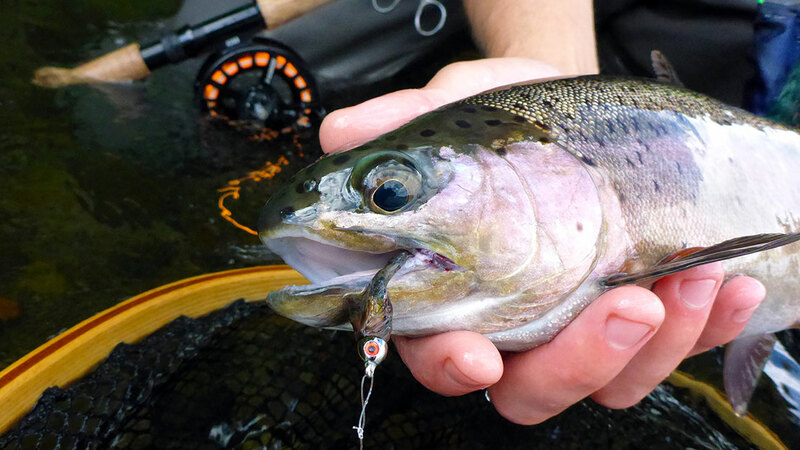 Some larger trout become sculpin killers and will often eat them. In our region, larger individuals of cutthroat, brown trout, rainbow trout and bull trout will eat sculpins. Both summer and winter steelhead have been known to dine on fillet of sculpin. Big resident rainbows in Alaska and Russia's Kamchatka eat large numbers of sculpins. The next time you wade your favorite trout stream, look for dead sculpins on the bottom; possible evidence of a big trout killing spree. Or better yet, fish a sculpin pattern with a very fast sinking fly line. You may find some larger than average trout. A great fly for big trout in medium to big rivers.